Although benign rashes are also caused by lamotrigine, it is not possible to predict reliably which rashes will prove to be serious or life threatening. Accordingly, lamotrigine should ordinarily be discontinued at the first sign of rash, unless the rash is clearly not drug related. Discontinuation of treatment may not prevent a rash from becoming life threatening or permanently disabling or disfiguring [see Warnings and Precautions (5.1)]. These highlights do not include all the information needed to use LAMOTRIGINE TABLETS FOR ORAL SUSPENSION safely and effectively. See full prescribing information for LAMOTRIGINE TABLETS FOR ORAL SUSPENSION. •exceeding recommended initial dose of lamotrigine. To report SUSPECTED ADVERSE REACTIONS, contact Alembic Pharmaceuticals Limited at 1-866-210-9797 or FDA at 1-800-FDA-1088 or www.fda.gov/medwatch. Lamotrigine tablets for oral suspension (chewable dispersible tablets) are indicated for conversion to monotherapy in adults (aged 16 years and older) with partial-onset seizures who are receiving treatment with carbamazepine, phenytoin, phenobarbital, primidone, or valproate as the single antiepileptic drug (AED). Safety and effectiveness of lamotrigine tablets for oral suspension (chewable dispersible tablets)have not been established (1) as initial monotherapy; (2) for conversion to monotherapy from AEDs other than carbamazepine, phenytoin, phenobarbital, primidone, or valproate; or (3) for simultaneous conversion to monotherapy from 2 or more concomitant AEDs. Lamotrigine tablets for oral suspension (chewable dispersible tablets) are indicated for the maintenance treatment of bipolar I disorder to delay the time to occurrence of mood episodes (depression, mania, hypomania, mixed episodes) in patients treated for acute mood episodes with standard therapy [see Clinical Studies (14.2)]. Treatment of acute manic or mixed episodes is not recommended. Effectiveness of lamotrigine tablets for oral suspension (chewable dispersible tablets) in the acute treatment of mood episodes has not been established. It is recommended that lamotrigine not be restarted in patients who discontinued due to rash associated with prior treatment with lamotrigine, unless the potential benefits clearly outweigh the risks. If the decision is made to restart a patient who has discontinued lamotrigine, the need to restart with the initial dosing recommendations should be assessed. The greater the interval of time since the previous dose, the greater consideration should be given to restarting with the initial dosing recommendations. If a patient has discontinued lamotrigine for a period of more than 5 half-lives, it is recommended that initial dosing recommendations and guidelines be followed. The half-life of lamotrigine is affected by other concomitant medications [see Clinical Pharmacology (12.3)]. Because lamotrigine is metabolized predominantly by glucuronic acid conjugation, drugs that are known to induce or inhibit glucuronidation may affect the apparent clearance of lamotrigine. Drugs that induce glucuronidation include carbamazepine, phenytoin, phenobarbital, primidone, rifampin, estrogen-containing oral contraceptives, and the protease inhibitors lopinavir/ritonavir and atazanavir/ritonavir. Valproate inhibits glucuronidation. For dosing considerations for lamotrigine in patients on estrogen-containing contraceptives and atazanavir/ritonavir, see below and Table 13. For dosing considerations for lamotrigine in patients on other drugs known to induce or inhibit glucuronidation, see Table 1, 2, 5, 6, and 13. Starting Lamotrigine in Women Taking Estrogen-Containing Oral Contraceptives: Although estrogen-containing oral contraceptives have been shown to increase the clearance of lamotrigine [see Clinical Pharmacology (12.3)], no adjustments to the recommended dose-escalation guidelines for lamotrigine should be necessary solely based on the use of estrogen-containing oral contraceptives. Therefore, dose escalation should follow the recommended guidelines for initiating adjunctive therapy with lamotrigine based on the concomitant AED or other concomitant medications (see Table 1, 5, and 7). See below for adjustments to maintenance doses of lamotrigine in women taking estrogen-containing oral contraceptives. (1) Taking Estrogen-Containing Oral Contraceptives:In women not taking carbamazepine, phenytoin, phenobarbital, primidone, or other drugs such as rifampin and the protease inhibitors lopinavir/ritonavir and atazanavir/ritonavir that induce lamotrigine glucuronidation [see Drug Interactions (7), Clinical Pharmacology (12.3)], the maintenance dose of lamotrigine will in most cases need to be increased by as much as 2-fold over the recommended target maintenance dose to maintain a consistent lamotrigine plasma level. (2) Starting Estrogen-Containing Oral Contraceptives:In women taking a stable dose of lamotrigine and not taking carbamazepine, phenytoin, phenobarbital, primidone, or other drugs such as rifampin and the protease inhibitors lopinavir/ritonavir and atazanavir/ritonavir that induce lamotrigine glucuronidation [see Drug Interactions (7), Clinical Pharmacology (12.3)], the maintenance dose will in most cases need to be increased by as much as 2-fold, to maintain a consistent lamotrigine plasma level. The dose increases should begin at the same time that the oral contraceptive is introduced and continue, based on clinical response, no more rapidly than 50 to 100 mg/day every week. Dose increases should not exceed the recommended rate (see Tables 1 and 5) unless lamotrigine plasma levels or clinical response support larger increases. Gradual transient increases in lamotrigine plasma levels may occur during the week of inactive hormonal preparation (pill-free week), and these increases will be greater if dose increases are made in the days before or during the week of inactive hormonal preparation. Increased lamotrigine plasma levels could result in additional adverse reactions, such as dizziness, ataxia, and diplopia. If adverse reactions attributable to lamotrigine consistently occur during the pill-free week, dose adjustments to the overall maintenance dose may be necessary. Dose adjustments limited to the pill-free week are not recommended. For women taking lamotrigine in addition to carbamazepine, phenytoin, phenobarbital, primidone, or other drugs such as rifampin and the protease inhibitors lopinavir/ritonavir and atazanavir/ritonavir that induce lamotrigine glucuronidation [see Drug Interactions (7), Clinical Pharmacology (12.3)], no adjustment to the dose of lamotrigine should be necessary. (3) Stopping Estrogen-Containing Oral Contraceptives: In women not taking carbamazepine, phenytoin, phenobarbital, primidone, or other drugs such as rifampin and the protease inhibitors lopinavir/ritonavir and atazanavir/ritonavir that induce lamotrigine glucuronidation [see Drug Interactions (7), Clinical Pharmacology (12.3)], the maintenance dose of lamotrigine will in most cases need to be decreased by as much as 50%, in order to maintain a consistent lamotrigine plasma level. The decrease in dose of lamotrigine should not exceed 25% of the total daily dose per week over a 2-week period, unless clinical response or lamotrigine plasma levels indicate otherwise [see Clinical Pharmacology (12.3)]. In women taking lamotrigine in addition to carbamazepine, phenytoin, phenobarbital, primidone, or other drugs such as rifampin and the protease inhibitors lopinavir/ritonavir and atazanavir/ritonavir that induce lamotrigine glucuronidation [see Drug Interactions (7), Clinical Pharmacology (12.3)], no adjustment to the dose of lamotrigine should be necessary. The effect of other hormonal contraceptive preparations or hormone replacement therapy on the pharmacokinetics of lamotrigine has not been systematically evaluated. It has been reported that ethinylestradiol, not progestogens, increased the clearance of lamotrigine up to 2-fold, and the progestin-only pills had no effect on lamotrigine plasma levels. Therefore, adjustments to the dosage of lamotriginein the presence of progestogens alone will likely not be needed. While atazanavir/ritonavir does reduce the lamotrigine plasma concentration, no adjustments to the recommended dose-escalation guidelines for lamotrigine should be necessary solely based on the use of atazanavir/ritonavir. Dose escalation should follow the recommended guidelines for initiating adjunctive therapy with lamotrigine based on concomitant AED or other concomitant medications (see Tables 1, 2, and 5). In patients already taking maintenance doses of lamotrigine and not taking glucuronidation inducers, the dose of lamotrigine may need to be increased if atazanavir/ritonavir is added, or decreased if atazanavir/ritonavir is discontinued [see Clinical Pharmacology (12.3)]. Initial doses of lamotrigine should be based on patients' concomitant medications (see Tables 1 to 3, and 5); reduced maintenance doses may be effective for patients with significant renal impairment [see Use in Specific Populations (8.7), Clinical Pharmacology (12.3)]. Few patients with severe renal impairment have been evaluated during chronic treatment with lamotrigine. Because there is inadequate experience in this population, lamotrigine should be used with caution in these patients. Epilepsy: For patients receiving lamotrigine in combination with other AEDs, a reevaluation of all AEDs in the regimen should be considered if a change in seizure control or an appearance or worsening of adverse reactions is observed. If a decision is made to discontinue therapy with lamotrigine, a step-wise reduction of dose over at least 2 weeks (approximately 50% per week) is recommended unless safety concerns require a more rapid withdrawal [see Warnings and Precautions (5.9)]. Bipolar Disorder: In the controlled clinical trials, there was no increase in the incidence, type, or severity of adverse reactions following abrupt termination of lamotrigine. In the clinical development program in adults with bipolar disorder, 2 patients experienced seizures shortly after abrupt withdrawal of lamotrigine. Discontinuation of lamotrigine should involve a step-wise reduction of dose over at least 2 weeks (approximately 50% per week) unless safety concerns require a more rapid withdrawal [see Warnings and Precautions (5.9)]. This section provides specific dosing recommendations for patients older than 12 years and patients aged 2 to 12 years. Within each of these age-groups, specific dosing recommendations are provided depending upon concomitant AED or other concomitant medications (see Table 1 for patients older than 12 years and Table 2 for patients aged 2 to 12 years). A weight-based dosing guide for patients aged 2 to 12 years on concomitant valproate is provided in Table 3. Lower starting doses and slower dose escalations than those used in clinical trials are recommended because of the suggestions that the risk of rash may be decreased by lower starting doses and slower dose escalations. Therefore, maintenance doses will take longer to reach in clinical practice than in clinical trials. It may take several weeks to months to achieve an individualized maintenance dose. Maintenance doses in patients weighing less than 30 kg, regardless of age or concomitant AED, may need to be increased as much as 50%, based on clinical response. The smallest available strength of lamotrigine tablets for oral suspension (chewable dispersible tablets)is 2 mg, and only whole tablets should be administered. If the calculated dose cannot be achieved using whole tablets, the dose should be rounded down to the nearest whole tablet [see How Supplied/Storage and Handling (16) and Medication Guide]. 1 to 5 mg/kg/day(maximum 200 mg/day in 1 or 2 divided doses). The usual maintenance doses identified in Tables 1 and 2 are derived from dosing regimens employed in the placebo-controlled adjunctive trials in which the efficacy of lamotriginewas established. In patients receiving multidrug regimens employing carbamazepine, phenytoin, phenobarbital, or primidone without valproate, maintenance doses of adjunctive lamotrigineas high as 700 mg/day have been used. In patients receiving valproate alone, maintenance doses of adjunctive lamotrigineas high as 200 mg/day have been used. The advantage of using doses above those recommended in Tables 1 to 4 has not been established in controlled trials. The goal of the transition regimen is to attempt to maintain seizure control while mitigating the risk of serious rash associated with the rapid titration of lamotrigine. The recommended maintenance dose of lamotrigine as monotherapy is 500 mg/day given in 2 divided doses. To avoid an increased risk of rash, the recommended initial dose and subsequent dose escalations for lamotrigine should not be exceeded [see Boxed Warning]. After achieving a dose of 500 mg/day of lamotrigine using the guidelines in Table 1, the concomitant AED enzyme-inducing should be withdrawn by 20% decrements each week over a 4-week period. The regimen for the withdrawal of the concomitant AED is based on experience gained in the controlled monotherapy clinical trial. No specific dosing guidelines can be provided for conversion to monotherapy with lamotriginewith AEDs other than carbamazepine, phenytoin, phenobarbital, primidone, or valproate. The goal of maintenance treatment with lamotrigine is to delay the time to occurrence of mood episodes (depression, mania, hypomania, mixed episodes) in patients treated for acute mood episodes with standard therapy [see Indications and Usage (1.2)]. Patients taking lamotrigine for more than 16 weeks should be periodically reassessed to determine the need for maintenance treatment. The target dose of lamotrigine is 200 mg/day (100 mg/day in patients taking valproate, which decreases the apparent clearance of lamotrigine, and 400 mg/day in patients not taking valproate and taking either carbamazepine, phenytoin, phenobarbital, primidone, or other drugs such as rifampin and the protease inhibitors lopinavir/ritonavir that increase the apparent clearance of lamotrigine). In the clinical trials, doses up to 400 mg/day as monotherapy were evaluated; however, no additional benefit was seen at 400 mg/day compared with 200 mg/day [see Clinical Studies (14.2)]. Accordingly, doses above 200 mg/day are not recommended. Treatment with lamotrigine is introduced, based on concurrent medications, according to the regimen outlined in Table 5. If other psychotropic medications are withdrawn following stabilization, the dose of lamotrigine should be adjusted. In patients discontinuing valproate, the dose of lamotrigine should be doubled over a 2-week period in equal weekly increments (see Table 6). In patients discontinuing carbamazepine, phenytoin, phenobarbital, primidone, or other drugs such as rifampin and the protease inhibitors lopinavir/ritonavir and atazanavir/ritonavir that induce lamotrigine glucuronidation, the dose of lamotrigine should remain constant for the first week and then should be decreased by half over a 2-week period in equal weekly decrements (see Table 6). The dose of lamotrigine may then be further adjusted to the target dose (200 mg) as clinically indicated. If other drugs are subsequently introduced, the dose of lamotrigine may need to be adjusted. In particular, the introduction of valproate requires reduction in the dose of lamotrigine [see Drug Interactions (7), Clinical Pharmacology (12.3)]. To avoid an increased risk of rash, the recommended initial dose and subsequent dose escalations of lamotrigine should not be exceeded [see Boxed Warning]. Lamotrigine may be swallowed whole, chewed, or dispersed in water or diluted fruit juice. If the tablets are chewed, consume a small amount of water or diluted fruit juice to aid in swallowing. To disperse lamotrigine tablets for oral suspension (chewable dispersible tablets), add the tablets to a small amount of liquid (1 teaspoon, or enough to cover the medication). Approximately 1 minute later, when the tablets are completely dispersed, swirl the solution and consume the entire quantity immediately. No attempt should be made to administer partial quantities of the dispersed tablets. 5 mg, white to off white, caplet-shaped tablets debossed with ‘L217’ on one side and plain on other side. 25 mg, white to off white, super elliptical-shaped tablets debossed with ‘L’ on one side and ‘218’ on other side. Lamotrigine is contraindicated in patients who have demonstrated hypersensitivity (e.g., rash, angioedema, acute urticaria, extensive pruritus, mucosal ulceration) to the drug or its ingredients [see Boxed Warning, Warnings and Precautions (5.1), (5.3)]. Phenylketonurics:Phenylalanine is a component of aspartame. Each lamotrigine tablets for oral suspension (chewable dispersible tablets) 5 mg and 25 mg contains 1.4 mg and 0.98 mg of phenylalanine, respectively. The incidence of serious rash associated with hospitalization and discontinuation of lamotrigine in a prospectively followed cohort of pediatric patients (aged 2 to 17 years)is approximately 0.3% to 0.8%. One rash-related death was reported in a prospectively followed cohort of 1,983 pediatric patients (aged 2 to 16 years) with epilepsy taking lamotrigine as adjunctive therapy. Additionally, there have been rare cases of toxic epidermal necrolysis with and without permanent sequelae and/or death in U.S. and foreign postmarketing experience. Hemophagocytic lymphohistiocytosis (HLH) has occurred in pediatric and adult patients taking lamotrigine for various indications. HLH is a life-threatening syndrome of pathologic immune activation characterized by clinical signs and symptoms of extreme systemic inflammation. It is associated with high mortality rates if not recognized early and treated. Common findings include fever, hepatosplenomegaly, rash, lymphadenopathy, neurologic symptoms, cytopenias, high serum ferritin, and liver function and coagulation abnormalities. In cases of HLH reported with lamotrigine, patients have presented with signs of systemic inflammation (fever, rash, hepatosplenomegaly, and organ system dysfunction) and blood dyscrasias. Symptoms have been reported to occur within 8 to 24 days following the initiation of treatment. Patients who develop early manifestations of pathologic immune activation should be evaluated immediately, and a diagnosis of HLH should be considered. Lamotrigine should be discontinued if an alternative etiology for the signs or symptoms cannot be established. Multiorgan hypersensitivity reactions, also known as drug reaction with eosinophilia and systemic symptoms (DRESS) have occurred with lamotrigine. Some have been fatal or life-threatening. DRESS typically, although not exclusively, presents with fever, rash, and/or lymphadenopathy in association with other organ system involvement, such as hepatitis, nephritis, hematologic abnormalities, myocarditis, or myositis, sometimes resembling an acute viral infection. Eosinophilia is often present. This disorder is variable in its expression, and other organ systems not noted here may be involved. There have been reports of blood dyscrasias that may or may not be associated with multiorgan hypersensitivity (also known as DRESS) [see Warnings and Precautions (5.2)]. These have included neutropenia, leukopenia, anemia, thrombocytopenia, pancytopenia, and, rarely, aplastic anemia and pure red cell aplasia. Pooled analyses of 199 placebo-controlled clinical trials (monotherapy and adjunctive therapy) of 11 different AEDs showed that patients randomized to one of the AEDs had approximately twice the risk (adjusted Relative Risk 1.8, 95% CI:1.2, 2.7) of suicidal thinking or behavior compared with patients randomized to placebo. In these trials, which had a median treatment duration of 12 weeks, the estimated incidence of suicidal behavior or ideation among 27,863 AED-treated patients was 0.43%, compared with 0.24% among 16,029 placebo-treated patients, representing an increase of approximately 1 case of suicidal thinking or behavior for every 530 patients treated. There were 4 suicides in drug-treated patients in the trials and none in placebo-treated patients, but the number of events is too small to allow any conclusion about drug effect on suicide. Patients, their caregivers, and families should be informed that AEDs increase the risk of suicidal thoughts and behavior and should be advised of the need to be alert for the emergence or worsening of the signs and symptoms of depression, any unusual changes in mood or behavior, or the emergence of suicidal thoughts or suicidal behavior, or thoughts about self-harm. Behaviors of concern should be reported immediately to healthcare providers. Postmarketing cases of aseptic meningitis have been reported in pediatric and adult patients taking lamotrigine for various indications. Symptoms upon presentation have included headache, fever, nausea, vomiting, and nuchal rigidity. Rash, photophobia, myalgia, chills, altered consciousness, and somnolence were also noted in some cases. Symptoms have been reported to occur within 1 day to one and a half months following the initiation of treatment. In most cases, symptoms were reported to resolve after discontinuation of lamotrigine. Re-exposure resulted in a rapid return of symptoms (from within 30 minutes to 1 day following reinitiation of treatment) that were frequently more severe. Some of the patients treated with lamotrigine who developed aseptic meningitis had underlying diagnoses of systemic lupus erythematosus or other autoimmune diseases. Medication errors involving lamotrigine have occurred. In particular, the name lamotrigine can be confused with the names of other commonly used medications. Medication errors may also occur between the different formulations of lamotrigine. To reduce the potential of medication errors, write and say lamotrigine clearly. Depictionsof the lamotrigine tablets for oral suspension (chewable dispersible tablets)can be found in the Medication Guide that accompanies the product to highlight the distinctive markings, colors, and shapes that serve to identify the different presentations of the drug and thus may help reduce the risk of medication errors. To avoid the medication error of using the wrong drug or formulation, patients should be strongly advised to visually inspect their tablets to verify that they are lamotrigine, as well as the correct formulation of lamotrigine, each time they fill their prescription. Some estrogen-containing oral contraceptives have been shown to decrease serum concentrations of lamotrigine [see Clinical Pharmacology (12.3)]. Dosage adjustments will be necessary in most patients who start or stop estrogen-containing oral contraceptives while taking lamotrigine[see Dosage and Administration (2.1)]. During the week of inactive hormone preparation (pill-free week) of oral contraceptive therapy, plasma lamotrigine levels are expected to rise, as much as doubling by the end of the week. Adverse reactions consistent with elevated levels of lamotrigine, such as dizziness, ataxia, and diplopia, could occur. Valid estimates of the incidence of treatment-emergent status epilepticus among patients treated with lamotrigine are difficult to obtain because reporters participating in clinical trials did not all employ identical rules for identifying cases. At a minimum, 7 of 2,343 adult patients had episodes that could unequivocally be described as status epilepticus. In addition, a number of reports of variably defined episodes of seizure exacerbation (e.g., seizure clusters, seizure flurries, etc.) were made. Because lamotrigine binds to melanin, it could accumulate in melanin-rich tissues over time. This raises the possibility that lamotrigine may cause toxicity in these tissues after extended use. Although ophthalmological testing was performed in 1 controlled clinical trial, the testing was inadequate to exclude subtle effects or injury occurring after long-term exposure. Moreover, the capacity of available tests to detect potentially adverse consequences, if any, of lamotrigine’s binding to melanin is unknown [see Clinical Pharmacology (12.2)]. The value of monitoring plasma concentrations of lamotrigine in patients treated with lamotrigine has not been established. Because of the possible pharmacokinetic interactions between lamotrigine and other drugs including AEDs (see Table 13), monitoring of the plasma levels of lamotrigine and concomitant drugs may be indicated, particularly during dosage adjustments. In general, clinical judgment should be exercised regarding monitoring of plasma levels of lamotrigine and other drugs and whether or not dosage adjustments are necessary. Most Common Adverse Reactions in All Clinical Trials: Adjunctive Therapy in Adults with Epilepsy: The most commonly observed (≥5% for lamotrigine and more common on drug than placebo) adverse reactions seen in association with lamotrigine during adjunctive therapy in adults and not seen at an equivalent frequency among placebo-treated patients were: dizziness, ataxia, somnolence, headache, diplopia, blurred vision, nausea, vomiting, and rash. Dizziness, diplopia, ataxia, blurred vision, nausea, and vomiting were dose related. Dizziness, diplopia, ataxia, and blurred vision occurred more commonly in patients receiving carbamazepine with lamotrigine than in patients receiving other AEDs with lamotrigine. Clinical data suggest a higher incidence of rash, including serious rash, in patients receiving concomitant valproate than in patients not receiving valproate [see Warnings and Precautions (5.1)]. In a dose-response trial in adults, the rate of discontinuation of lamotrigine for dizziness, ataxia, diplopia, blurred vision, nausea, and vomiting was dose related. In 339 patients aged 2 to 16 years with partial-onset seizures or generalized seizures of Lennox-Gastaut syndrome, 4.2% of patients on lamotrigine and 2.9% of patients on placebo discontinued due to adverse reactions. The most commonly reported adverse reaction that led to discontinuation of lamotrigine was rash. aAdverse reactions that occurred in at least 2% of patients treated with lamotrigine and at a greater incidence than placebo. bPatients in these adjunctive trials were receiving 1 to 3 of the concomitant antiepileptic drugs carbamazepine, phenytoin, phenobarbital, or primidone in addition to lamotrigine or placebo. Patients may have reported multiple adverse reactions during the trial or at discontinuation; thus, patients may be included in more than 1 category. The overall adverse reaction profile for lamotrigine was similar between females and males, and was independent of age. Because the largest non-Caucasian racial subgroup was only 6% of patients exposed to lamotrigine in placebo-controlled trials, there are insufficient data to support a statement regarding the distribution of adverse reaction reports by race. Generally, females receiving either lamotrigine as adjunctive therapy or placebo were more likely to report adverse reactions than males. The only adverse reaction for which the reports on lamotrigine were > 10% more frequent in females than males (without a corresponding difference by gender on placebo) was dizziness (difference = 16.5%). There was little difference between females and males in the rates of discontinuation of lamotrigine for individual adverse reactions. aAdverse reactions that occurred in at least 5% of patients treated with lamotrigine and at a greater incidence than valproate-treated patients. bPatients in this trial were converted to lamotrigine or valproate monotherapy from adjunctive therapy with carbamazepine or phenytoin. Patients may have reported multiple adverse reactions during the trial; thus, patients may be included in more than 1 category. The most common adverse reactions seen in association with the use of lamotrigine as monotherapy (100 to 400 mg/day) in adult patients (aged 18 to 82 years) with bipolar disorder in the 2 double-blind, placebo-controlled trials of 18 months’ duration are included in Table 12. Adverse reactions that occurred in at least 5% of patients and were numerically more frequent during the dose-escalation phase of lamotrigine in these trials (when patients may have been receiving concomitant medications) compared with the monotherapy phase were: headache (25%), rash (11%), dizziness (10%), diarrhea (8%), dream abnormality (6%), and pruritus (6%). During the monotherapy phase of the double-blind, placebo-controlled trials of 18 months’ duration, 13% of 227 patients who received lamotrigine (100 to 400 mg/day), 16% of 190 patients who received placebo, and 23% of 166 patients who received lithium discontinued therapy because of an adverse reaction. The adverse reactions that most commonly led to discontinuation of lamotrigine were rash (3%) and mania/hypomania/mixed mood adverse reactions (2%). Approximately 16% of 2,401 patients who received lamotrigine (50 to 500 mg/day) for bipolar disorder in premarketing trials discontinued therapy because of an adverse reaction; most commonly due to rash (5%) and mania/hypomania/mixed mood adverse reactions (2%). aAdverse reactions that occurred in at least 5% of patients treated with lamotrigine and at a greater incidence than placebo. bPatients in these trials were converted to lamotrigine (100 to 400 mg/day) or placebo monotherapy from add-on therapy with other psychotropic medications. Patients may have reported multiple adverse reactions during the trial; thus, patients may be included in more than 1 category. cIn the overall bipolar and other mood disorders clinical trials, the rate of serious rash was 0.08% (1 of 1,233) of adult patients who received lamotrigine as initial monotherapy and 0.13% (2 of 1,538) of adult patients who received lamotrigine as adjunctive therapy [see Warnings and Precautions (5.1)]. Adverse Reactions following Abrupt Discontinuation: In the 2 controlled clinical trials, there was no increase in the incidence, severity or type of adverse reactions in patients with bipolar disorder after abruptly terminating therapy with lamotrigine. In the clinical development program in adults with bipolar disorder, 2 patients experienced seizures shortly after abrupt withdrawal of lamotrigine [see Warnings and Precautions (5.8)]. Mania/Hypomania/Mixed Episodes: During the double-blind, placebo-controlled clinical trials in bipolar I disorder in which adults were converted to monotherapy with lamotrigine (100 to 400 mg/day) from other psychotropic medications and followed for up to 18 months, the rates of manic or hypomanic or mixed mood episodes reported as adverse reactions were 5% for patients treated with lamotrigine (n = 227), 4% for patients treated with lithium (n = 166), and 7% for patients treated with placebo (n = 190). In all bipolar controlled trials combined, adverse reactions of mania (including hypomania and mixed mood episodes) were reported in 5% of patients treated with lamotrigine (n = 956), 3% of patients treated with lithium (n = 280), and 4% of patients treated with placebo (n = 803). Infrequent: Akathisia, apathy, aphasia, central nervous system depression, depersonalization, dysarthria, dyskinesia, euphoria, hallucinations, hostility, hyperkinesias, hypertonia, libido decreased, memory decrease, mind racing, movement disorder, myoclonus, panic attack, paranoid reaction, personality disorder, psychosis, sleep disorder, stupor, and suicidal ideation. Rare: Choreoathetosis, delirium, delusions, dysphoria, dystonia, extrapyramidal syndrome, faintness, grand mal convulsions, hemiplegia, hyperalgesia, hyperesthesia, hypokinesia, hypotonia, manic depression reaction, muscle spasm, neuralgia, neurosis, paralysis, peripheral neuritis. The following adverse reactions have been identified during postapproval use of lamotrigine. Because these reactions are reported voluntarily from a population of uncertain size, it is not always possible to reliably estimate their frequency or establish a causal relationship to drug exposure. Aggression, exacerbation of parkinsonian symptoms in patients with pre-existing Parkinson's disease, tics. ↓ levonorgestrel Decreased lamotrigine levels approximately 50%.
? carbamazepine epoxide Addition of carbamazepine decreases lamotrigine concentration approximately 40%. Lopinavir/ritonavir ↓ lamotrigine Decreased lamotrigine concentration approximately 50%. Atazanavir/ritonavir ↓ lamotrigine Decreased lamotrigine AUC approximately 32%. Phenobarbital/primidone ↓ lamotrigine Decreased lamotrigine concentration approximately 40%. Phenytoin ↓ lamotrigine Decreased lamotrigine concentration approximately 40%. Rifampin ↓ lamotrigine Decreased lamotrigine AUC approximately 40%.
? valproate Increased lamotrigine concentrations slightly more than 2-fold. ↓ = Decreased (induces lamotrigine gluronidation). ↑= Increased (inhibits lamotrigine glucuronidation). To provide information regarding the effects of in utero exposure to lamotrigine, physicians are advised to recommend that pregnant patients taking lamotrigine tablets for oral suspension (chewable dispersible tablets) enroll in the North American Antiepileptic Drug (NAAED) Pregnancy Registry. This can be done by calling the toll free number 1-888-233-2334, and must be done by patients themselves. Information on the registry can also be found at the website http://www.aedpregnancyregistry.org/. Lamotrigine is present in milk from lactating women taking lamotrigine. Data from 904 multiple small studies indicate that lamotrigine plasma levels in human milk-fed infants have 905 been reported to be as high as 50% of the maternal serum levels. Neonates and young infants are 906 at risk for high serum levels because maternal serum and milk levels can rise to high levels 907 postpartum if lamotrigine dosage has been increased during pregnancy but not later reduced to 908 the pre-pregnancy dosage. Lamotrigine exposure is further increased due to the immaturity of the 909 infant glucuronidation capacity needed for drug clearance. Events including apnea, drowsiness, 910 and poor sucking have been reported in infants who have been human milk-fed by mothers using 911 lamotrigine; whether or not these events were caused by lamotrigine is unknown. Human 912 milk-fed infants should be closely monitored for adverse events resulting from lamotrigine. 913 Measurement of infant serum levels should be performed to rule out toxicity if concerns arise. 914 Human milk-feeding should be discontinued in infants with lamotrigine toxicity. Caution should 915 be exercised when lamotrigine is administered to a nursing woman. Safety and efficacy of lamotrigine, used as adjunctive treatment for partial-onset seizures were not demonstrated in a small, randomized, double-blind, placebo-controlled withdrawal trial in very young pediatric patients (aged 1 to 24 months). Lamotrigine was associated with an increased risk for infectious adverse reactions (lamotrigine 37%, Placebo 5%), and respiratory adverse reactions (lamotrigine 26%, Placebo 5%). Infectious adverse reactions included bronchiolitis, bronchitis, ear infection, eye infection, otitis externa, pharyngitis, urinary tract infection, and viral infection. Respiratory adverse reactions included nasal congestion, cough, and apnea. Clinical trials of lamotrigine for epilepsy and bipolar disorder did not include sufficient numbers of patients aged 65 years and older to determine whether they respond differently from younger patients or exhibit a different safety profile than that of younger patients. In general, dose selection for an elderly patient should be cautious, usually starting at the low end of the dosing range, reflecting the greater frequency of decreased hepatic, renal, or cardiac function, and of concomitant disease or other drug therapy. Initial doses of lamotrigine should be based on patients’ AED regimen; reduced maintenance doses may be effective for patients with significant renal impairment. Few patients with severe renal impairment have been evaluated during chronic treatment with lamotrigine. Because there is inadequate experience in this population, lamotrigine should be used with caution in these patients [see Dosage and Administration (2.1)]. Overdoses involving quantities up to 15 g have been reported for lamotrigine, some of which have been fatal. Overdose has resulted in ataxia, nystagmus, increased seizures, decreased level of consciousness, coma, and intraventricular conduction delay. Lamotrigine tablets for oral suspension USP (chewable dispersible tablets) are supplied for oral administration. The tablets contain 5 mg (white to off white), or 25 mg (white to off white) of lamotrigine and the following inactive ingredients: mannitol, crospovidone, povidone K-30, microcrystalline cellulose, aspartame, black currant flavor, colloidal silicon dioxide, magnesium stearate and talc. Drug product complies with Organic Impurities procedure II. Lamotrigine did not inhibit N-methyl d-aspartate (NMDA)-induced depolarizations in rat cortical slices or NMDA-induced cyclic GMP formation in immature rat cerebellum, nor did lamotrigine displace compounds that are either competitive or noncompetitive ligands at this glutamate receptor complex (CNQX, CGS, TCHP). The IC50 for lamotrigine effects on NMDA-induced currents (in the presence of 3 μM of glycine) in cultured hippocampal neurons exceeded 100 μM. In vitro, lamotrigine inhibited dihydrofolate reductase, the enzyme that catalyzes the reduction of dihydrofolate to tetrahydrofolate. Inhibition of this enzyme may interfere with the biosynthesis of nucleic acids and proteins. When oral daily doses of lamotrigine were given to pregnant rats during organogenesis, fetal, placental, and maternal folate concentrations were reduced. Significantly reduced concentrations of folate are associated with teratogenesis [see Use in Specific Populations (8.1)].Folate concentrations were also reduced in male rats given repeated oral doses of lamotrigine. Reduced concentrations were partially returned to normal when supplemented with folinic acid. In dogs, lamotrigine is extensively metabolized to a 2-N-methyl metabolite. This metabolite causes dose-dependent prolongations of the PR interval, widening of the QRS complex, and, at higher doses, complete AV conduction block. Similar cardiovascular effects are not anticipated in humans because only trace amounts of the 2-N-methyl metabolite (<0.6% of lamotrigine dose) have been found in human urine [see Clinical Pharmacology (12.3)]. However, it is conceivable that plasma concentrations of this metabolite could be increased in patients with a reduced capacity to glucuronidate lamotrigine (e.g., in patients with liver disease, patients taking concomitant medications that inhibit glucuronidation). aThe majority of parameter means determined in each study had coefficients of variation between 20% and 40% for half-life and CL/F and between 30% and 70% for Tmax. The overall mean values were calculated from individual study means that were weighted based on the number of volunteers/subjects in each study. The numbers in parentheses below each parameter mean represent the range of individual volunteer/subjects values across studies. b Carbamazepine, phenytoin, phenobarbital, and primidone have been shown to increase the apparent clearance of lamotrigine. Estrogen-containing oral contraceptives and other drugs such as rifampin and protease inhibitors lopinavir/ritonavir and atazanavir/ritonavir, that induce lamotrigine glucuronidation have also been shown to increase the apparent clearance of lamotrigine [see Drug Interactions (7)]. Lamotrigine is rapidly and completely absorbed after oral administration with negligible first-pass metabolism (absolute bioavailability is 98%). The bioavailability is not affected by food. Peak plasma concentrationsoccur anywhere from 1.4 to 4.8 hours following drug administration. The lamotrigine tablets for oral suspension (chewable dispersible tablets)were found to be equivalent, whether they were administered as dispersed in water, chewed and swallowed, or swallowed as whole, to the lamotrigine compressed tablets in terms of rate and extent of absorption.In terms of rate and extent of absorption, lamotrigine orally disintegrating tablets whether disintegrated in the mouth or swallowed whole with water were equivalent to the lamotrigine compressed tablets swallowed with water. Following multiple administrations (150 mg twice daily) to normal volunteers taking no other medications, lamotrigine induced its own metabolism, resulting in a 25% decrease in t½ and a 37% increase in CL/F at steady state compared with values obtained in the same volunteers following a single dose. Evidence gathered from other sources suggests that self-induction by lamotrigine may not occur when lamotrigine is given as adjunctive therapy in patients receiving enzyme-inducing drugs such as carbamazepine, phenytoin, phenobarbital, primidone, or other drugs such as rifampin and protease inhibitors lopinavir/ritonavir and atazanavir/ritonavir that induce lamotrigine glucuronidation [see Drug Interactions (7)]. c The effect of other hormonal contraceptive preparations or hormone replacement therapy on the pharmacokinetics of lamotrigine has not been systematically evaluated in clinical trials, although the effect may be similar to that seen with the ethinylestradiol / levonorgestrel combinations. j Slight increase not expected to be clinically meaningful. The pharmacokinetics of a 100-mg single dose of lamotrigine in healthy volunteers (n = 12) were not changed by coadministration of bupropion sustained-release formulation (150 mg twice a day) starting 11 days before lamotrigine. Lamotrigine has no appreciable effect on steady-state carbamazepine plasma concentration. Limited clinical data suggest there is a higher incidence of dizziness, diplopia, ataxia, and blurred vision in patients receiving carbamazepine with lamotrigine than in patients receiving other AEDs with lamotrigine [see Adverse Reactions (6.1)]. The mechanism of this interaction is unclear. The effect of lamotrigine on plasma concentrations of carbamazepine – epoxide is unclear. In a small subset of patients (n = 7) studied in a placebo-controlled trial, lamotrigine had no effect on carbamazepine-epoxide plasma concentrations, but in a small, uncontrolled study (n = 9), carbamazepine-epoxide levels increased. Patients with Renal Impairment: Twelve volunteers with chronic renal failure (mean creatinine clearance: 13 mL/min; range: 6 to 23) and another 6 individuals undergoing hemodialysis were each given a single 100-mg dose of lamotrigine. The mean plasma half-lives determined in the study were 42.9 hours (chronic renal failure), 13.0 hours (during hemodialysis), and 57.4 hours (between hemodialysis) compared with 26.2 hours in healthy volunteers. On average, approximately 20% (range: 5.6 to 35.1) of the amount of lamotrigine present in the body was eliminated by hemodialysis during a 4-hour session [see Dosage and Administration (2.1)]. Patients with Hepatic Impairment: The pharmacokinetics of lamotrigine following a single 100-mg dose of lamotrigine were evaluated in 24 subjects with mild, moderate, and severe hepatic impairment (Child-Pugh classification system) and compared with 12 subjects without hepatic impairment. The subjects with severe hepatic impairment were without ascites (n = 2) or with ascites (n = 5). The mean apparent clearances of lamotrigine in subjects with mild (n = 12), moderate (n = 5), severe without ascites (n = 2), and severe with ascites (n = 5) liver impairment were 0.30 ± 0.09, 0.24 ± 0.1, 0.21 ± 0.04, and 0.15 ± 0.09 mL/min/kg, respectively, as compared with 0.37 ± 0.1 mL/min/kg in the healthy controls. Mean half-lives of lamotrigine in subjects with mild, moderate, severe without ascites, and severe with ascites hepatic impairment were 46 ± 20, 72 ± 44, 67 ± 11, and 100 ± 48 hours, respectively, as compared with 33 ± 7 hours in healthy controls [see Dosage and Administration (2.1)]. Population pharmacokinetic analyses involving subjects aged 2 to 18 years of age demonstrated that lamotrigine clearance was influenced predominantly by total body weight and concurrent AED therapy. The oral clearance of lamotrigine was higher, on a body weight basis, in pediatric patients than in adults. Weight-normalized lamotrigine clearance was higher in those subjects weighing less than 30 kg compared with those weighing greater than 30 kg. Accordingly, patients weighing less than 30 kg may need an increase of as much as 50% in maintenance doses, based on clinical response, as compared with subjects weighing more than 30 kg being administered the same AEDs [see Dosage and Administration (2.2)]. These analyses also revealed that, after accounting for body weight, lamotrigine clearance was not significantly influenced by age. Thus, the same weight-adjusted doses should be administered to children irrespective of differences in age. Concomitant AEDs which influence lamotrigine clearance in adults were found to have similar effects in children. Male and Female Patients: The clearance of lamotrigine is not affected by gender. However, during dose escalation of lamotrigine in 1 clinical trial in patients with epilepsy on a stable dose of valproate (n = 77), mean trough lamotrigine concentrations, unadjusted for weight, were 24% to 45% higher (0.3 to 1.7 mcg/mL) in females than in males. The effectiveness of lamotrigine as adjunctive therapy (added to other AEDs) was initially established in 3 pivotal,multicenter, placebo-controlled, double-blind clinical trials in 355 adults with refractory partial-onset seizures. The patients had a history of at least 4 partial-onset seizures per month in spite of receiving 1 or more AEDs at therapeutic concentrations and in 2 of the trials, were observed on their established AED regimen during baselines that varied between 8 to 12 weeks. In the third trial, patients were not observed in a prospective baseline. In patients continuing to have at least 4 seizures per month during the baseline, lamotrigine or placebo was then added to the existing therapy. In all 3 trials, change from baseline in seizure frequency was the primary measure of effectiveness. The results given below are for all partial-onset seizures in the intent-to-treat population (all patients who received at least 1 dose of treatment) in each trial, unless otherwise indicated. The median seizure frequency at baseline was 3 per week while the mean at baseline was 6.6 per week for all patients enrolled in efficacy trials. 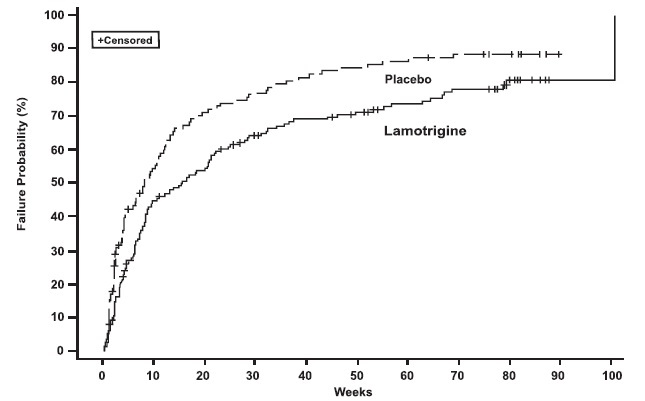 The effectiveness of lamotrigine as adjunctive therapy in patients with Lennox-Gastaut syndrome was established in a multicenter, double-blind, placebo-controlled trial in 169 patients aged 3 to 25 years (n = 79 on lamotrigine, n = 90 on placebo). Following a 4-week, single-blind, placebo phase, patients were randomized to 16 weeks of treatment with lamotrigine or placebo added to their current AED regimen of up to 3 drugs. Patients were dosed on a fixed-dose regimen based on body weight and valproate use. Target doses were designed to approximate 5 mg/kg/day for patients taking valproate (maximum dose: 200 mg/day) and 15 mg/kg/day for patients not taking valproate (maximum dose: 400 mg/day). The primary efficacy endpoint was percentage change from baseline in major motor seizures (atonic, tonic, major myoclonic, and tonicclonic seizures). For the intent-to-treat population, the median reduction of major motor seizures was 32% in patients treated with lamotrigine and 9% on placebo, a difference that was statistically significant (p<0.05). Drop attacks were significantly reduced by lamotrigine (34%) compared with placebo (9%), as were tonic-clonic seizures (36% reduction versus 10% increase for lamotrigine and placebo, respectively). 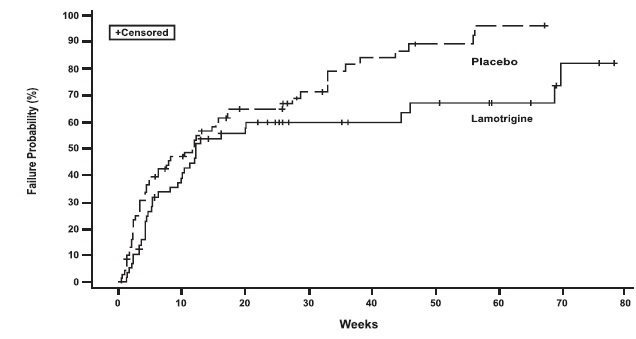 The effectiveness of lamotrigine as adjunctive therapy in patients with PGTC seizures was established in a multicenter, double-blind, placebo-controlled trial in 117 pediatric and adult patients aged 2 years and older (n = 58 on lamotrigine, n = 59 on placebo). Patients with at least 3 PGTC seizures during an 8-week baseline phase were randomized to 19 to 24 weeks of treatment with lamotrigine or placebo added to their current AED regimen of up to 2 drugs. Patients were dosed on a fixed-dose regimen, with target doses ranging from 3 to 12 mg/kg/day for pediatric patients and from 200 to 400 mg/day for adult patients based on concomitant AEDs. The primary efficacy endpoint was percentage change from baseline in PGTC seizures. For the intent-to-treat population, the median percent reduction of PGTC seizures was 66% in patients treated with lamotrigine and 34% on placebo, a difference that was statistically significant (P = 0.006). The effectiveness of lamotrigine in the maintenance treatment of bipolar I disorder was established in 2 multicenter, double-blind, placebo-controlled studies in adult patients (aged 18 to 82 years) who met DSM-IV criteria for bipolar I disorder. Trial 1 enrolled patients with a current or recent (within 60 days) depressive episode as defined by DSM-IV and Trial 2 included patients with a current or recent (within 60 days) episode of mania or hypomania as defined by DSM-IV. Both trials included a cohort of patients (30% of 404 subjects in trial 1 and 28% of 171 patients in Trial 2) with rapid cycling bipolar disorder (4 to 6 episodes per year). In both trials, patients were titrated to a target dose of 200 mg of lamotrigine, as add-on therapy or as monotherapy, with gradual withdrawal of any psychotropic medications during an 8- to 16-week open-label period. Overall 81% of 1,305 patients participating in the open-label period were receiving 1 or more other psychotropic medications, including benzodiazepines, selective serotonin reuptake inhibitors (SSRIs), atypical antipsychotics (including olanzapine), valproate, or lithium, during titration of lamotrigine. Patients with a CGI-severity score of 3 or less maintained for at least 4 continuous weeks, including at least the final week on monotherapy with lamotrigine, were randomized to a placebo-controlled, double-blind treatment period for up to 18 months. The primary endpoint was TIME (time to intervention for a mood episode or one that was emerging, time to discontinuation for either an adverse event that was judged to be related to bipolar disorder, or for lack of efficacy). The mood episode could be depression, mania, hypomania, or a mixed episode. In Trial 1, patients received double-blind monotherapy with lamotrigine, 50 mg/day (n = 50), lamotrigine 200 mg/day (n = 124), lamotrigine 400 mg/day (n = 47), or placebo (n = 121). Lamotrigine (200- and 400-mg/day treatment groups combined) was superior to placebo in delaying the time to occurrence of a mood episode (Figure 1). Separate analyses of the 200- and 400- mg/day dose groups revealed no added benefit from the higher dose. Store at 20 to 25°C (68 to 77°F); excursions permitted to 15°-30°C (59°-86°F) [see USP Controlled Room Temperature]. Prior to initiation of treatment with lamotrigine, inform patients that a rash or other signs or symptoms of hypersensitivity (e.g., fever, lymphadenopathy) may herald a serious medical event and instruct them to report any such occurrence to their healthcare providers immediately. Prior to initiation of treatment with lamotrigine, inform patients that excessive immune activation may occur with lamotrigine and that they should report signs or symptoms such as fever, rash, or lymphadenopathy to a healthcare provider immediately. Inform patients that multiorgan hypersensitivity reactions and acute multiorgan failure may occur with lamotrigine. Isolated organ failure or isolated blood dyscrasias without evidence of multiorgan hypersensitivity may also occur. Inform patients to contact their healthcare providers immediately if they experience any signs or symptoms of these conditions [see Warnings and Precautions (5.3, 5.4)]. Inform patients, their caregivers, and families that AEDs, including lamotrigine, may increase the risk of suicidal thoughts and behavior. Instruct them to be alert for the emergence or worsening of symptoms of depression, any unusual changes in mood or behavior, or the emergence of suicidal thoughts or behavior or thoughts about self-harm. Instruct them to immediately report behaviors of concern to their healthcare providers . Inform patients that lamotrigine may cause dizziness, somnolence, and other symptoms and signs of central nervous system depression. Accordingly, instruct them neither to drive a car nor to operate other complex machinery until they have gained sufficient experience on lamotrigine to gauge whether or not it adversely affects their mental and/or motor performance. Instruct patients to notify their healthcare providers if they become pregnant or intend to become pregnant during therapy. and if they intend to breastfeed or are breastfeeding an infant. Instruct women to notify their healthcare providers if they plan to start or stop use of oral contraceptives or other female hormonal preparations. Starting estrogen-containing oral contraceptives may significantly decrease lamotrigine plasma levels and stopping estrogen- containing oral contraceptives (including the pill-free week) may significantly increase lamotrigine plasma levels [see Warnings and Precautions (5.8), Clinical Pharmacology (12.3)]. Also instruct women to promptly notify their healthcare providers if they experience adverse reactions or changes in menstrual pattern (e.g., break-through bleeding) while receiving lamotrigine in combination with these medications. Instruct patients to notify their healthcare providers if they stop taking lamotrigine for any reason and not to resume lamotrigine without consulting their healthcare providers . Inform patients that lamotrigine may cause aseptic meningitis. Instruct them to notify their healthcare providers immediately if they develop signs and symptoms of meningitis such as headache, fever, nausea, vomiting, stiff neck, rash, abnormal sensitivity to light, myalgia, chills, confusion, or drowsiness while taking lamotrigine. To avoid a medication error of using the wrong drug or formulation, strongly advise patients to visually inspect their tablets to verify that they are lamotrigine, as well as the correct formulation of lamotrigine, each time they fill their prescription [see Dosage Forms and Strengths (3.2), How Supplied/Storage and Handling (16)]. Refer the patient to the Medication Guide that provides depictions of the lamotrigine tablets for oral suspension (chewable dispersible tablets). Medication Guide available at http://www.alembicusa.com/medicationguide.aspx or call 1-866-210-9797. Phenylketonurics: Phenylalanine is a component of aspartame. Each lamotrigine tablets for oral suspension (chewable dispersible tablets) 5 mg and 25 mg contains 1.4 mg and 0.98 mg of phenylalanine, respectively. What is the most important information I should know about lamotrigine tablets for oral suspension (chewable dispersible tablets)? 1. Lamotrigine tablets for oral suspension (chewabale dispersible tablets) may cause a serious skin rash that may cause you to be hospitalized or even cause death. There is no way to tell if a mild rash will become more serious. A serious skin rash can happen at any time during your treatment with lamotrigine tablets for oral suspension (chewabale dispersible tablets), but is more likely to happen within the first 2 to 8 weeks of treatment. Children and teenagers aged between 2 and 17 years have a higher chance of getting this serious skin rash while taking lamotrigine tablets for oral suspension (chewabale dispersible tablets). · take lamotrigine tablets for oral suspension (chewable dispersible tablets) while taking valproate (DEPAKENE (valproic acid) or DEPAKOTE(divalproex sodium)). · take a higher starting dose of lamotrigine tablets for oral suspension (chewable dispersible tablets) than your healthcare provider prescribed. · increase your dose of lamotrigine tablets for oral suspension (chewable dispersible tablets) faster than prescribed. These symptoms may be the first signs of a serious skin reaction. A healthcare provider should examine you to decide if you should continue taking lamotrigine tablets for oral suspension (chewable dispersible tablets). 3. Like other antiepileptic drugs, lamotrigine tablets for oral suspension (chewable dispersible tablets) may cause suicidal thoughts or actions in a very small number of people, about 1 in 500. Do not stop lamotrigine tablets for oral suspension (chewable dispersible tablets)without first talking to a healthcare provider. · Stopping lamotrigine tablets for oral suspension (chewable dispersible tablets) suddenly can cause serious problems. How can I watch for early symptoms of suicidal thoughts and actions in myself or a family memeber? 4. Lamotrigine tablets for oral suspension (chewable dispersible tablets) may cause aseptic meningitis, a serious inflammation of the protective membrane that covers the brain and spinal cord. Meningitis has many causes other than lamotrigine tablets for oral suspension (chewable dispersible tablets), which your doctor would check for if you developed meningitis while taking lamotrigine tablets for oral suspension (chewable dispersible tablets). 5. People prescribed lamotrigine tablets for oral suspension (chewable dispersible tablets) have sometimes been given the wrong medicine because many medicines have names similar to lamotrigine tablets for oral suspension (chewable dispersible tablets), so always check that you receive lamotrigine tablets for oral suspension (chewable dispersible tablets). · Make sure you can read it clearly. · Talk to your pharmacist to check that you are given the correct medicine. · Each time you fill your prescription, check the tablets you receive against the pictures of the tablets below. These pictures show the distinct wording, colors, and shapes of the tablets that help to identify the right strength of lamotrigine tablets for oral suspension (chewable dispersible tablets). Immediately call your pharmacist if you receive a lamotrigine tablets for oral suspension (chewable dispersible tablets) that does not look like one of the tablets shown below, as you may have received the wrong medication. What is lamotrigine tablet for oral suspension (chewable dispersible tablet)? o together with other medicines to treat certain types of seizures (partial-onset seizures, primary generalized tonic-clonic seizures, generalized seizures of Lennox-Gastaut syndrome) in people aged 2 years and older. o alone when changing from1 other medicine used to treat partial-onset seizures in people aged 16 years and older. o for the long-term treatment of bipolar I disorder to lengthen the time between mood episodes in people who have been treated for mood episodes with other medicine. • It is not known if lamotrigine tablet for oral suspension (chewable dispersible tablet) is safe or effective in people younger than 18 years with mood episodes such as bipolar disorder or depression. • It is not known if lamotrigine tablets for oral suspension (chewable dispersible tablets) are safe or effective when used alone as the first treatment of seizures. • It is not known if lamotrigine tablets for oral suspension (chewabale dispersible tablets) are safe or effective for people with mood episodes who have not already been treated with other medicines. • Lamotrigine tablets for oral suspension (chewabale dispersible tablets) should not be used for acute treatment of manic or mixed mood episodes. • If you have had an allergic reaction to lamotrigine or to any of the inactive ingredients in lamotrigine tablets for oral suspension (chewable dispersible tablets). See the end of this leaflet for a complete list of ingredients in lamotrigine tablets for oral suspension (chewable dispersible tablets). • have had a rash or allergic reaction to another antiseizure medicine. • have or have had depression, mood problems or suicidal thoughts or behavior. • have had aseptic meningitis after taking lamotrigine tablets for oral suspension (chewable dispersible tablets). • are taking oral contraceptives (birth control pills) or other female hormonal medicines. Do not start or stop taking birth control pills or other female hormonal medicine until you have talked with your healthcare provider. Tell your healthcare provider if you have any changes in your menstrual pattern such as breakthrough bleeding. Stopping these medicines while you are taking lamotrigine tablets for oral suspension (chewable dispersible tablets) may cause side effects (such as dizziness, lack of coordination, or double vision). Starting these medicines may lessen how well lamotrigine tablets for oral suspension (chewable dispersible tablets) works. • are pregnant or plan to become pregnant. It is not known if lamotrigine tablets for oral suspension (chewable dispersible tablets) may harm your unborn baby. If you become pregnant while taking lamotrigine tablets for oral suspension (chewable dispersible tablets), talk to your healthcare provider about registering with the North American Antiepileptic Drug Pregnancy Registry. You can enroll in this registry by calling 1-888-233-2334. The purpose of this registry is to collect information about the safety of antiepileptic drugs during pregnancy. • are breastfeeding. Lamotrigine passes into your breast milk and may cause side effects in a breastfed baby. If you breastfeed while taking lamotrigine tablets for oral suspension (chewable dispersible tablets), watch your baby closely for trouble breathing, episodes of temporarily stopping breathing, sleepiness, or poor sucking. Call your baby’s healthcare provider right away if you see any of these problems. Talk to your healthcare provider about the best way to feed your baby if you take lamotrigine tablets for oral suspension (chewable dispersible tablets). Tell your healthcare provider about all the medicines you take, including prescription and over-the-counter medicines, vitamins, and herbal supplements. Lamotrigine tablets for oral suspension (chewable dispersible tablets) and certain other medicines may interact with each other. This may cause serious side effects. How should I take lamotrigine tablets for oral suspension (chewable dispersible tablets)? • Take lamotrigine tablets for oral suspension (chewable dispersible tablets) exactly as prescribed. • Your healthcare provider may change your dose. Do not change your dose without talking to your healthcare provider. • Do not stop taking lamotrigine tablets for oral suspension (chewable dispersible tablets) without talking to your healthcare provider. Stopping lamotrigine tablets for oral suspension (chewable dispersible tablets) suddenly may cause serious problems. For example, if you have epilepsy and you stop taking lamotrigine tablets for oral suspension (chewable dispersible tablets) suddenly, you may have seizures that do not stop. Talk with your healthcare provider about how to stop lamotrigine tablets for oral suspension (chewable dispersible tablets) slowly. • If you miss a dose of lamotrigine tablets for oral suspension (chewable dispersible tablets), take it as soon as you remember. If it is almost time for your next dose, just skip the missed dose. Take the next dose at your regular time. Do not take 2 doses at the same time. • If you take too much lamotrigine tablets for oral suspension (chewable dispersible tablets), call your healthcare provider or your local Poison Control Center or go to the nearest hospital emergency room right away. • You may not feel the full effect of lamotrigine tablets for oral suspension (chewable dispersible tablets) for several weeks. • If you have epilepsy, tell your healthcare provider if your seizures get worse or if you have any new types of seizures. • Lamotrigine tablets for oral suspension (chewable dispersible tablets) may be swallowed whole, chewed, or mixed in water or diluted fruit juice. If the tablets are chewed, drink a small amount of water or diluted fruit juice to help in swallowing. To break up lamotrigine tablets for oral suspension (chewable dispersible tablets), add the tablets to a small amount of liquid (1 teaspoon, or enough to cover the medicine) in a glass or spoon. Wait at least 1 minute or until the tablets are completely broken up, mix the solution together and take the whole amount right away. What should I avoid while taking lamotrigine tablets for oral suspension (chewable dispersible tablets)? Do not drive, operate machinery or do other dangerous activities until you know how lamotrigine tablets for oral suspension (chewable dispersible tablets) affects you. What are the possible side effects of lamotrigine tablets for oral suspension (chewable dispersible tablets)? Lamotrigine tablets for oral suspension (chewable dispersible tablets) can cause serious side effects. These are not all the possible side effects of lamotrigine tablets for oral suspension (chewable dispersible tablets). How should I store lamotrigine tablets for oral suspension (chewable dispersible tablets)? • Store at 20 to 25°C (68 to 77°F); excursions permitted to 15°-30°C (59°-86°F) [see USP Controlled Room Temperature]. • Keep lamotrigine tablets for oral suspension (chewable dispersible tablets) and all medicines out of the reach of children. Medicines are sometimes prescribed for purposes other than those listed in a Medication Guide. Do not use lamotrigine tablets for oral suspension (chewable dispersible tablets) for a condition for which it was not prescribed. Do not give lamotrigine tablets for oral suspension (chewable dispersible tablets) to other people, even if they have the same symptoms that you have. It may harm them. If you take a urine drug screening test, lamotrigine tablets for oral suspension (chewable dispersible tablets) may make the test result positive for another drug. If you require a urine drug screening test, tell the healthcare professional administering the test that you are taking lamotrigine tablets for oral suspension (chewable dispersible tablets). You can ask your healthcare provider or pharmacist for information about lamotrigine tablets for oral suspension (chewable dispersible tablets) that is written for health professionals. For more information about lamotrigine tablets for oral suspension (chewable dispersible tablets), call Alembic Pharmaceuticals Limited at 1-866-210-9797. What are the ingredients in lamotrigine tablets for oral suspension (chewable dispersible tablets)? Inactive ingredients: mannitol, crospovidone, povidone K-30, microcrystalline cellulose, aspartame, black currant flavor, colloidal silicon dioxide, magnesium stearate and talc.